Many Asian countries have long been home to cold noodle dishes, and in contemporary times, they have become a popular way to fight the heat during summer. And in Korea, naengmyeon is the cold noodle dish of choice to fight the humid summer. 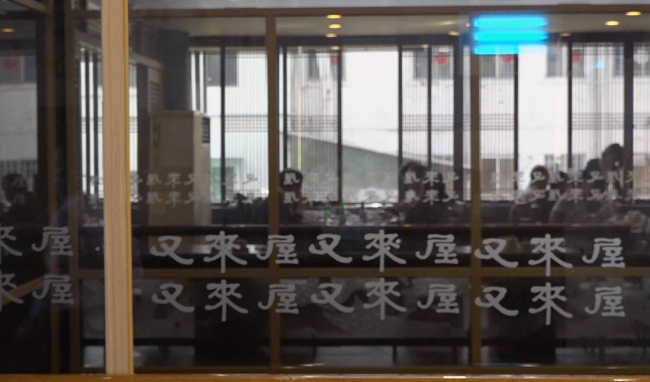 Long lines of people brave the heat outside for at least 30 minutes to get into Seoul’s top restaurants for cold noodles -- their decades of history keeping them popular despite their unfashionable locations in run-down inner-city areas. Inside, the summertime refreshment on offer comes either as noodles lumped inside a tangy and icy broth, or noodles with spicy paste spread on top. Diners have their own ways of varying the taste, whisking a hard-boiled egg yolk into the broth or adding droplets of vinegar or mustard oil into the bowl. 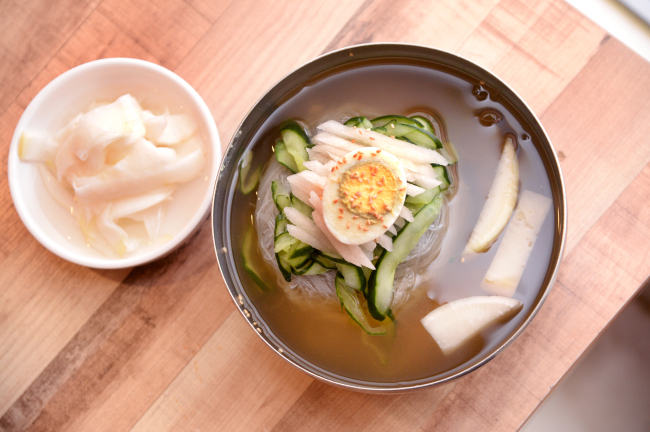 Historical records indicate naengmyeon was initially not a summer dish. Known to have existed since mid-Goryeo Dynasty, naengmyeon was only available in winter for centuries, when Koreans had difficulty storing ice. It was not until the late 19th century, when a system for keeping and supplying ice was put in place, that naengmyeon was considered a summer food. 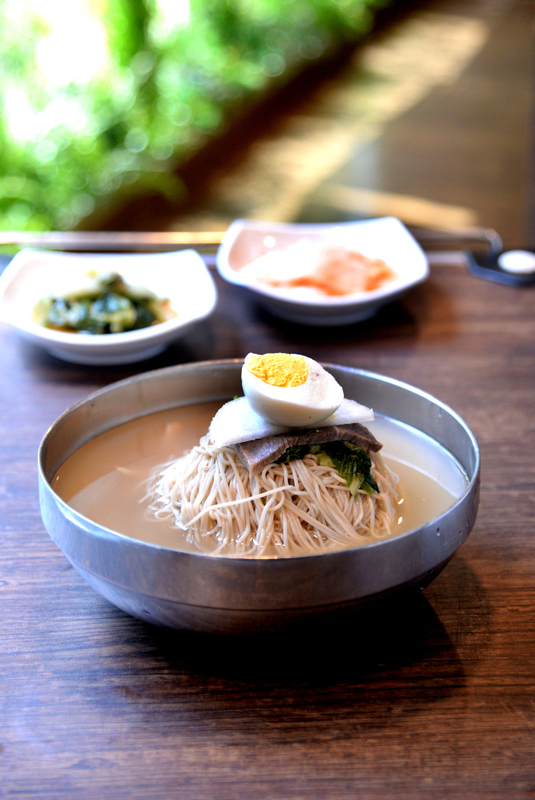 But even to this day, to some Koreans, naengmyeon has meant much more than just a dish to beat the heat. To elderly people who came as refugees from North Korea during the Korean War in the 1950s, making or eating naengmyeon was a nostalgic treat. Some refugees have arrived in South Korea with recipes to make traditional cold noodles in the Pyongyang style, using buckwheat, its local staple crop, for the noodles. Others made them in Hamhung style, using potato or sweet potato starch. Also popular were some North Korean-inspired cold noodle varieties, including milmyeon, which was created in Busan, and kodari naengmyeon, a dish with semi-dried pollock that was developed in Sokcho, Gangwon Province. Restaurants selling naengmyeon using North Korean recipes began to dominate the South Korean market after the cease-fire in 1953, forcing out restaurants that sold less authentic versions. Kang Kil-jun, 77, fled from North Korea’s Kangwon Province during the Korean War when he was 9 years old. “I had naengmyeon when I was young, but I was too young to remember what it was like,” he said, after a lunch in a naengmyeon restaurant. Now, younger generations have also taken to the cold noodle dish. Jeong Sung-wook, 36, said that there were many fans of naengmyeon in his workplace, including himself and a chief executive of his company, but the reason was different. While Jeong’s boss is an escapee from North Korea’s Hamhung Province, Jeong, like other people from younger generations, chooses to eat naengmyeon for the taste. Jeong also said that the younger generation tends to consider naengmyeon as a food for all four seasons. Recently, naengmyeon has gained media attention amid the mood of rapprochement between North and South Korea. Between the people of the two Koreas that have been divided for nearly 70 years, naengmyeon is seen as one of a few commonalities. Broadcasters in South Korea aired clips of art troupe members eating Pyongyang naengmyeon a famous North Korean restaurant called Okryugwan. Korean folk singer Kang San-e, whose parents are North Korean refugees, said he was “deeply moved” by the fact that he was eating Pyongyang-style naengmyeon in his parents’ home country, during his visit to Pyongyang for a concert.